Garden spiders (Araneus diadematus) mature in late summer and autumn. 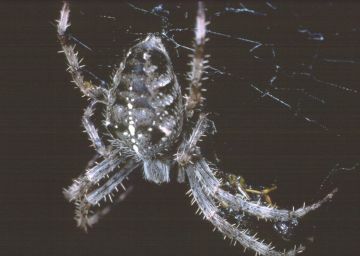 Please note that the spider is VERY VARIABLE in colour, shape, size and markings. 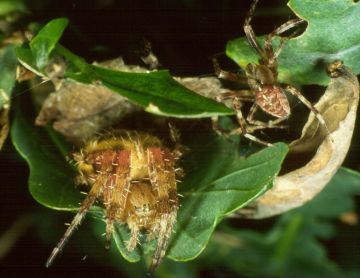 Although the central cross on the abdomen is usually distinct, poorly marked individuals are not uncommon, and orange-brown individuals may easily be confused with Araneus alsine, the so-called strawberry spider, a species which is not found in gardens or urban habitats. Please also note that the spiderlings of many related araneid spiders have a similar appearance and cannot be identified to species.